One of a kind wearable art necklaces, earrings, bracelets and bolos handmade of natural stones and semi-precious gems such as agates, amethyst, lapis lazuli, aquamarine, moonstone, labradorite, malachite, onyx, tiger eye, sodalite, turquoise, various jaspers, rhyolite, and jade as well as crystals, coral, pearls, fossils, and abalone. Many cabochons, crystals, druzies and nuggets are wrapped in gold, silver, bronze, copper, or black wire and some incorporate a silver charm, such as an eagle, moose, horse, or wolf. 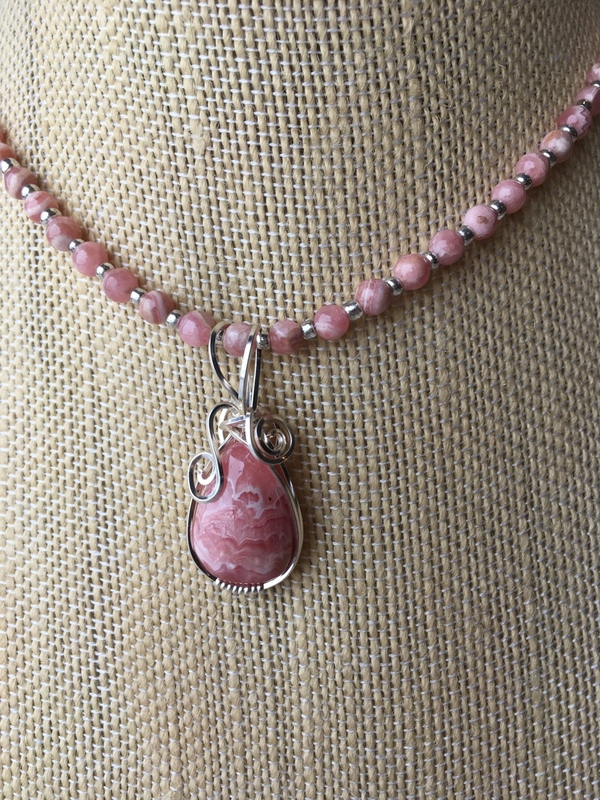 Colorado State Mineral, a delicate pendant wrapped in silver on matching necklace. Could be sold or worn separately with simple silver necklace. Beaded necklace could also be sold or worn separately. A three in one combo that could be adapted to many occasions.